Meet Jimmy the Robot ScrumMaster! The public has become very familiar with robots. From the Lost In Space TV show in the 1960’s with its “B-9, Class M-3 General Utility Non-Theorizing Environmental Control Robot” to R2D2 and C3PO from Star Wars to robot drones used by hobbyists, photographers, the CIA and air forces around the world, robots seem to be anywhere. However, the reality is most of the functionally associated with robots is the stuff of TV and movies. The vision dramatically exceeds the reality. "What would you like your robot to do?" "What sort of fun or useful apps can you imagine for your robot?" "How would you make the future of robots awesome?" The 21st Century Robot Project aims to have the software community build apps, like on a smartphone or tablet, to personal robots. The site says this about the goal. At Effective Agile Development, the mission is to make the process of developing software more productive using Agile product development using the Scrum framework. The 21st Century Robot Project provides an excellent platform to make that mission more fun and interesting. To that end, Effective Agile Development is announcing the use of the Interbotics HR-OS1 from Trossen Robotics as the new platform for the development environment in the Effective Scrum Developer class which is part of the Certified Scrum Developer program from the Scrum Alliance. Here is what the 21st Century Robot Project web site says about the platform. Rod Claar, Certified Scrum Trainer and Principal Consultant at Effective Agile Development explains the benefits of the HR-OS1 this way. 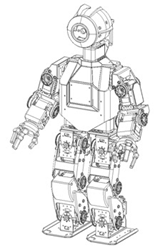 The 21st Century Robot Project calls their prototype robot “Jimmy”, the class platform will be extended and named Jimmy the Robot ScrumMaster. The teamwork and collaboration on a Scrum team. The principles that drive code quality and support quick delivery of business value from testable, understandable and correct code. Using the practice of Test First to help ensure the requirements are well understood and automated tests can be added to the build process to validate the system in the future. The process of improving the design of software to increase the understandability and testability of the code and allow for easy and safe additions to the system in the future. The process of creating and running automated build and test cycles as new code is checked in so that cross-application issues are discovered as soon as possible. So what would you want a robot to be able to do? For more information on the 21st Century Robot see the web site at http://www.21stcenturyrobot.com. For more information about Effective Agile Development and the Effective Scrum Developer course see their web site at http://www.EffectiveAgileDev.com . Effective Agile Development LLC (EAD) is a privately owned training and consulting company based in the Seattle area specializing in Scrum and Agile product development. EAD offers a comprehensive training portfolio for public or private delivery and on-site team coaching. A complete list of services is available on the EAD web site. For more information, contact EAD at info(at)effectiveagiledev(dot)com or toll free at 1-(888) 294-1865.